A couple of days ago, we were all on the lookout for Janet Napoles. Well, she has finally surfaced. Which lines do you think President Aquino sang the night she surrendered? 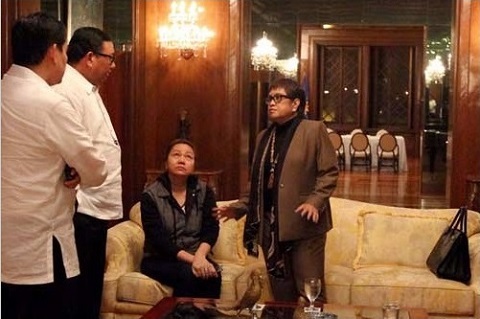 Looking at Napoles’ surrender photo however (or is that her official Instagram look up photo), could she have had an entirely different song in mind? Is she going to sing Lord, Patawad, or is this just her Instagram look up photo? Original photo by Rodolfo Manabat. Which brings us to the question: Will it all soon be over when the fat lady sings? Hardly. We’ve only just begun. She faces charges for the illegal detention of the pork barrel scam whistleblower, Benhur Luy. She has yet to face charges for allegedly stealing our money. She has yet to expose the congressmen and senators involved in all this and then these legally sanctioned hoodlums have yet to face the gallows. At the rate we’re going, I have a higher chance of being crowned the queen of England than seeing this issue resolved in this century. Just like so many other political scandals that have unfolded before us, this one might just become the latest instalment to The Never Ending Story, following these yet unresolved cases: the Jose Pidal account, the NBN-ZTE deal, the fertilizer fund scam and the AFP corruption scandal. 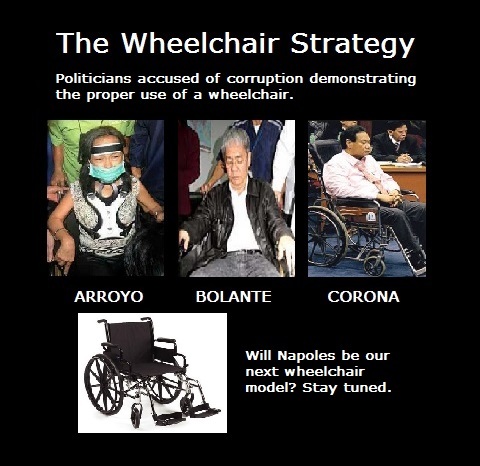 In the meantime, as the story unfolds, we all wonder if Napoles will be the next Philippine Top Model in a wheelchair? Every high profile individual who has been suspected of corruption has used the wheelchair strategy before. Our only real hope is for the Filipino people to never forget the injustice done to us but we all know Filipinos have a combined memory the size of a peanut. Tomorrow, will we forget that our lawmakers stole our money and go back to regular programming? It’ll be an easy switch from the heightened awareness channel back to the mind-numbing telenovela channel where our collective intelligence is frequently stolen in installments as well. Hahaha db LV yung WC ni PORK este Janet Napoles :) Nakakalungkot ang scam na to- daming gutom sa Pinas at daming walang tirahan pero ang mga inaasahan na mga pulitiko ay walang ginawa kundi MAGNAKAW AT MAGPAYAMAN! Pork Barrel scam is a true-to-life story for everyone Filipino has learned on how the public servants used the people's money. This requires justice and the money squandered should be returned and given to the people not in infrastructure, not in agricultural inputs, but in the form of a sustainable livelihood. If the fat lady sings. This is so true in this case but yes there are so many unresolved graft cases in the country but I'm hoping things would end up better. I am praying that the graft and corruption will end in the Philippines. People like her who use to make false documents, etc... are brave enough in doing this because of some corrupt politicians. Wheelchair model-- this made me laugh! I could not agree more. I think it's a strategy that has worked everytime so let's expect that. Seriously, I pray that all these will be exposed and due punishment will be given to those who are guilty! I hope everyone who 'voted' for these corrupt politicians (linked with Napoles) read this! Vote lang ng vote habang may time, lols. Ikasa ang wheelchair! Haha yup, I think she will be the next one who'd sit on a wheelchair. Ngayon pa nga lang may demand na dapat may nurse to take care of her inside the cell. Special treatment talaga. the funny thing was we again have a rice shortage... parang nagamit na kasi yan to divert the attention from the zte scandal. hope the government will give justice to the people... praying for it. Yahweh bless.